Upon the order at the store from coming to our shop Itadai. ※ Start making it after receiving your order, you wait a little thing there is the congestion. Please note. You'll call us in advance to our shop, upon the order. Once we receive your call in advance, without having to have kept you waiting in the shop, can be freshly prepared dishes in time coming. Order form available at the site. Your name Your e-mail address and telephone number, please send us the date stated on the menu, visit us order quantity. Upon check in our shop, you will receive an email reply. ※Order forms, we'll only limited dates since a week after order date.Note, thank you. We accept orders at the following hours. 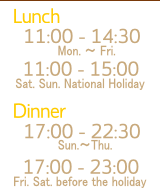 ※ The lunch and dinner, the menu is slightly different order.See Take Out Menu please click here. ※ Between 12:00 to 13:30 will not accept orders for the busy. We accept that other than your time.Note, thank you. Each menu page T.O T.O You can choose from the menu “T.O”marked, please order. T.O is the only menu for lunch,T.O is the dinner menu. Copyright © 2019 SHAH Co.,Ltd All Rights Reserved.